"Urge Congress to VOTE NO on the deceptive amendment to the Horse Protection Act HR693"
More laws will not stop those already in violation of existing laws! Urge Congress to Vote NO on deceptive HR 693 to amend the Horse Protection Act with animal rights directed policy to harm the entire horse industry. The Prevent All Soring Tactics (P.A.S.T.) Act was written and sponsored by the Humane Society of the United States, a radical animal rights organization. The Horse Protection Act (HPA) is a federal law that exists to regulate the already illegal practice of soring horses and prohibits sored horses from participating in shows, exhibition, sales or auctions. 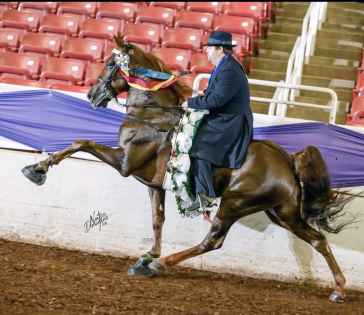 The HPA also prohibits the transportation of sored horses to or from any of these events for the Tennessee Walking Horse and other gaited horse show areanas. More laws will NOT stop those already in violation of the Horse Protection Act. HR 693 does NOTHING to address the problem of unethical participants who are already in violation of existing laws. HR 693 amends the Horse Protection Act which already imposes strong rules and regulations on the Tennessee Walking Horse Industry. HR 693 issues penalties based on the standards of the animal rights groups. The economic impact of HR 693 would be detrimental to farriers, veterinarians, feed and tack companies, restaurants, motels, retail stores, trailer/truck dealers, and many more businesses. If passed, HR 693 will remove all pads, weighted shoes, and all action devices from show horses of three specified breeds—Tennessee Walking Horse, Racking Horse, and Spotted Saddle Horse. At a time when Congress is looking to create jobs, this misguided and deceptive bill would destroy what is left of the walking horse industry and do NOTHING to stop cruelty! Let's enforce the laws we already have -- we don't need NEW laws! Please send an email to your Congressional Representative and U.S. Senator OPPOSING HR 693 by clicking the "Send Message" link below. Please be sure to personalize the boiler plate message provided.